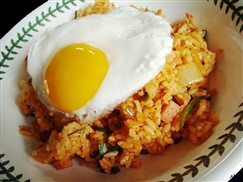 Kimchi-bokkeumbap is a Korean version of Fried rice made from Kimchi-bokkeum. Kimchi-bokkeum is a dish made by stir-frying old Kimchi in a sauce made of sesame oil, sesame seeds, corn syrup or sugar and Kimchi juice. Kimchi-bokkeum is usually eaten alone or used as a base for Kimchi-bokkeumbap. Easy and cheap to make, Kimchi-bokkeumbap is a testament to the Korean creativity. 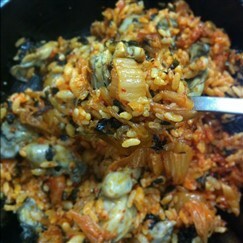 Kimchi-bokkeumbap is usually made from old Kimchi and leftover rice. It can also be made from the scratch with new Kimchi and newly cooked rice but old Kimchi gives a more robust and rich flavour to the meal. Use a cast iron pan to keep the ingredients at a constant temperature while cooking and avoid stickiness. 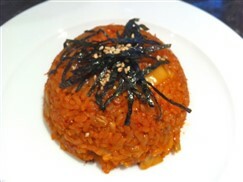 Kimchi-bokkeumbap is made with short-grain rice, Kimchi, onions, carrots, Kimchi juice, soy sauce, gochujang, sesame oil, vegetable oil and salt. Beef, bacon, or ham can also be added to the meal. Mayonnaise can be added to an overly spicy Kimchi. Fried egg, sesame leaves and scallions are usually used to garnish the meal before serving. Not bad for a cheap meal. Even better with an egg thrown on top. Older kimchi is better. I like when they add in extra seaweed and sesame.